Abdollah, Z., Khodi, S., Gheybi, E., Amani, J., Karami, A. (2018). Recombinant Expression and Purification of Human Cystatin C Biomarker in Escherichia coli for Prediagnostic Renal Disorders. Journal of Applied Biotechnology Reports, 5(1), 13-18. Zahra Abdollah; Samaneh Khodi; Elaheh Gheybi; Jafar Amani; Ali Karami. "Recombinant Expression and Purification of Human Cystatin C Biomarker in Escherichia coli for Prediagnostic Renal Disorders". 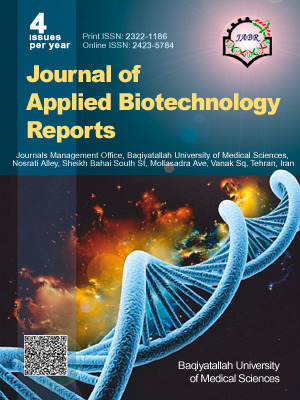 Journal of Applied Biotechnology Reports, 5, 1, 2018, 13-18. Abdollah, Z., Khodi, S., Gheybi, E., Amani, J., Karami, A. (2018). 'Recombinant Expression and Purification of Human Cystatin C Biomarker in Escherichia coli for Prediagnostic Renal Disorders', Journal of Applied Biotechnology Reports, 5(1), pp. 13-18. Abdollah, Z., Khodi, S., Gheybi, E., Amani, J., Karami, A. Recombinant Expression and Purification of Human Cystatin C Biomarker in Escherichia coli for Prediagnostic Renal Disorders. Journal of Applied Biotechnology Reports, 2018; 5(1): 13-18. Introduction: Chronic kidney disease is a worldwide health problem and Glomerular filtration rate (GFR) is the most frequently used criteria in the assessment of rental function. Cystatin C as a member of type 2 cystatin superfamily and cysteine-protease inhibitor is found in high concentrations in all biological fluids. This study is aimed to study cystatin C as a potent biomarker for clinical measurement of renal disorders and other diseases. Materials and Methods: In this study, the human cystatin C construct was analyzed by bioinformatics software. It was cloned and expressed to produce an appropriate antigen for anti-cystatin C (anti-Cys C) obtained from mice Balb/C as a crucial point in the improvement of an enzyme-linked immunosorbent assay (ELISA) method. Serum samples were given from 32 hospitalized patients with renal failure and cardiovascular disease and non-hospitalized patients were tested by ELISA method using anti-Cys C obtained from mice Balb/C. Results: Our findings indicated 0.36-2.4 mg/L as the best conclusion for antigen cystatin C in patients’ sera and 1/50 dilution for anti-Cys C obtained from mice Balb/C and showed a relationship between patients with high creatinine and high concentration of cystatin C. In case of five cardiovascular disease patients with normal upper limit of Creatinine we obtained cystatin C lower than kidney failure and raising of cystatin C in 6 patients with increased TSH were seen. Conclusions: Polyclonal anti-Cys C antibodies were obtained through the immunization of Balb/C mice can be employed as an anti-Cys C in ELISA for diagnosis of some renal dysfunction. Levey AS, Coresh J, Balk E, et al. National Kidney Foundation practice guidelines for chronic kidney disease: evaluation, classification, and stratification. Ann Intern Med. 2003;139(2):137- 147. Rule AD, Larson TS, Bergstralh EJ, Slezak JM, Jacobsen SJ, Cosio FG. Using serum creatinine to estimate glomerular filtration rate: accuracy in good health and in chronic kidney disease. Ann Intern Med. 2004;141(12):929-937. Mousa M, El-Saeid M, Hamdy M. Evaluation of Cystatin C, Fibronectin and Alpha-Feto Protein as Biochemical Markers in Patients with Liver Diseases. J Am Sci. 2012;8(7):770-779. Brguljan PM, Cimerman N. Human cystatin C. Turk J Biochem. 2007;32(3):95-103. Turk B, Turk D, Salvesen GS. Regulating cysteine protease activity: essential role of protease inhibitors as guardians and regulators. Curr Pharm Des. 2002;8(18):1623-1637. Dousdampanis P, Trigka K, Fourtounas C. Diagnosis and management of chronic kidney disease in the elderly: a field of ongoing debate. Aging Dis. 2012;3(5):360-372. Chen ZK, Ge CJ, Hu SJ. [The relationship of cystatin C and cardiovascular diseases]. Sheng Li Ke Xue Jin Zhan. 2003;34(3):269-271. Piwowar A, Knapik-Kordecka M, Buczynska H, Warwas M. Plasma cystatin C concentration in non-insulin-dependent diabetes mellitus: relation with nephropathy. Arch Immunol Ther Exp (Warsz). 1999;47(5):327-331. Chew JS, Saleem M, Florkowski CM, George PM. Cystatin C--a paradigm of evidence based laboratory medicine. Clin Biochem Rev. 2008;29(2):47-62. Ristiniemi N. Quantification and Clinical Relevance of Cystatin C. Turku, Finland: Annales Universitatis Turkuensis; 2014. Abdollah Z, Karami A, Amani J, Khodi S, Gheybi E. In silico study of Cystatin C protein to Develop an ELISA kit using Computational tools and servers. Bull Environ Pharmacol Life Sci. 2015;4(7):87- 94. Abrahamson M. Human cysteine proteinase inhibitors. Isolation, physiological importance, inhibitory mechanism, gene structure and relation to hereditary cerebral hemorrhage. Scand J Clin Lab Invest Suppl. 1988;191:21-31. Saitoh E, Sabatini LM, Eddy RL, et al. The human cystatin C gene (CST3) is a member of the cystatin gene family which is localized on chromosome 20. Biochem Biophys Res Commun. 1989;162(3):1324-1331.